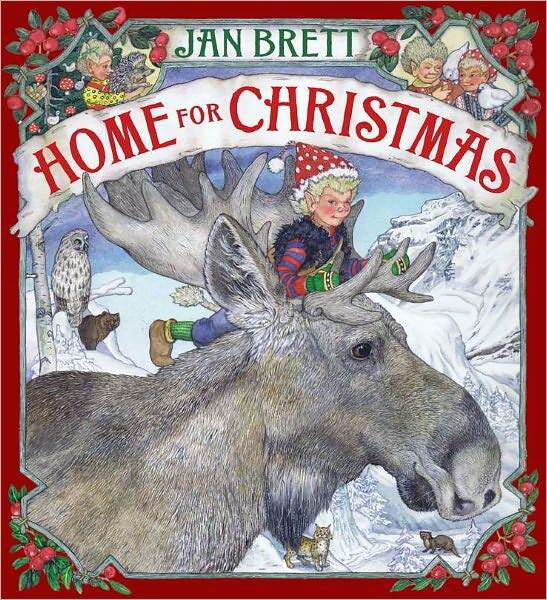 When I was shopping at the end of November I picked up Home For Christmas not realizing it is the newest book by Jan Brett. I knew it was a Jan Brett but didn’t notice the 2011 publication date. I hadn’t even read the book but decided it would be good for the 8th day of December when we were to decorate our Gingerbread House. This is the tale of a young and carefree troll named Rollo who still has his tale, because trolls only loose their tail if they are kind. Always doing whatever he wants Rollo leaves home and on his journey spends time with different animal families throughout the year. No matter what he does he just doesn’t seem to fit in with any of the animals for very long, and ends up back at home, a changed troll, just in time for Christmas. We read through it for simple enjoyment, and loved taking in Brett’s pictures but their are so many literacy and character connection that can be made. As with all of Brett’s book the illustrations are perfect for helping children predict what is coming up next in the story, and inferring what the characters are feeling and thinking. This was to be a fun activity so I didn’t want to get too serious – on to the Gingerbread house. Now we do a Gingerbread house from scratch every year and it is a 3 day adventure. 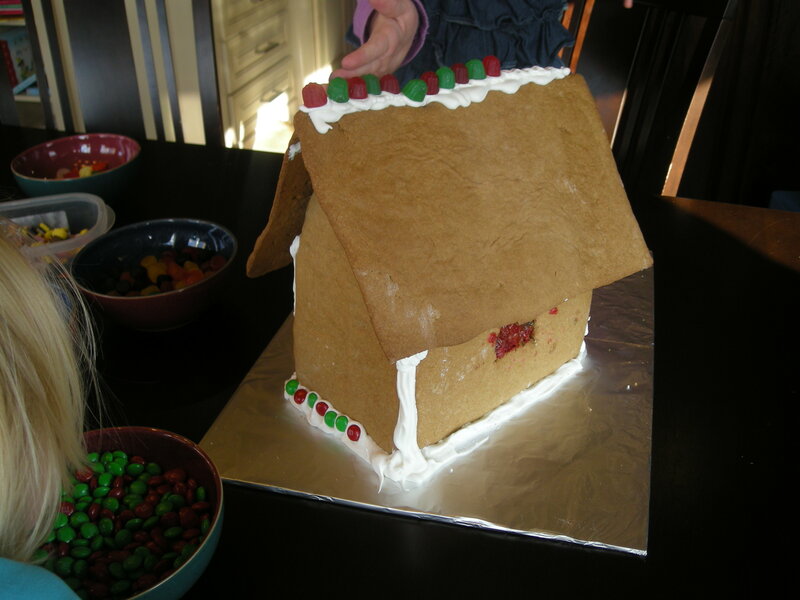 A number of years ago I found a great site that gave a perfect outline and template for making a gingerbread house. I printed it off and we use the same recipe every year. The first year I made templates for the shapes and a board for the house, which are put back into one of our many Christmas boxes after the holidays to be brought out the next year. On day 1 I bake the house and sometimes get a bit of help from the girls. I always have lots of dough left over and make Gingerbread Men out of the leftovers. Sometimes I make the stained glass windows using lifesavers (if I remember before baking) and this year the girls loved crushing the lifesavers. On day 2 I assemble the house. I use books and pop cans to help prop up the pieces. This is an activity for after the kids have gone to bed! Day 3, which fell on December 8th this year, is the fun day – it is decorating day. I took Kaitlyn to the grocery store bulk section and let her pick out a variety of candies. We we everything up on the table and decorated! Mommy’s job is to put the icing on and the girls are responsible for decorating. This is the first year I pretty much did none of the decorating. 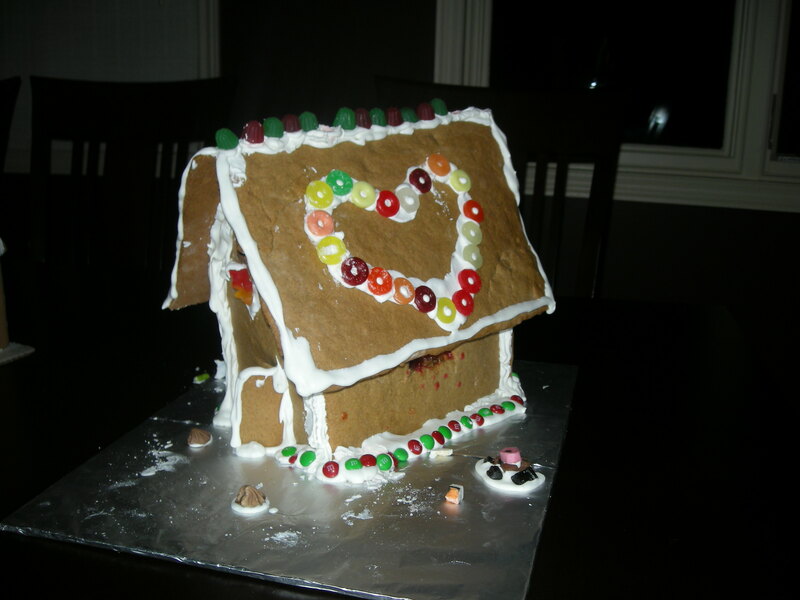 Kaitlyn is very much into hearts so she put a large heart on each side of the roof. Eileen pretty much ate more candy than she put on the house, but she made a good effort with creating a pattern with the M&Ms. This year we pretty much had to decorate the house twice. We did it Thursday afternoon before the daycare Christmas concert, but while I was getting Eileen dressed for the concert Michael crawled up on the table and ate off half of the candy (most of it he simply spit out). I quickly cleaned up the mess the best I could and then when we got home from the concert we decorated it again. Now it is kept well out of reach from Michael. It has dried but I still don’t want to take any chances!